An outstanding decorative dahlia, owing to its tightly-packed, fuchsia pink double petals and yellowish centres. Compact height of 40cm (16in). One of the most sought-after old semi-double dahlias from the 1920s, with scarlet red flowers and bronze foliage. Height 1.1m (43in). 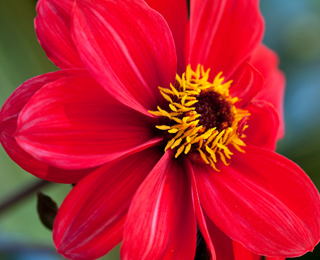 A well-known vivid single dahlia with attractive, deep purple foliage and fiery red and yellow blooms. Height: 80cm (32in).